The acclaimed 1964 bullfighting film will hit Blu-ray in January. In an early announcement to retailers, Criterion is readying 'The Moment of Truth' for Blu-ray on January 24. 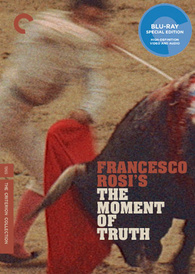 'The Moment of Truth,' from director Francesco Rosi is a visceral plunge into the life of a famous torero—played by real-life bullfighting legend Miguel Mateo, known as Miguelin. The Blu-ray will feature a new high-definition digital restoration with uncompressed monaural soundtrack and supplements include an interview with director Francesco Rosi from 2004 and a booklet featuring an essay by critic Peter Matthews. Suggested list price for the Blu-ray is $39.95. You can find the latest specs for 'The Moment of Truth' linked from our Blu-ray Release Schedule, where it is indexed under January 24.